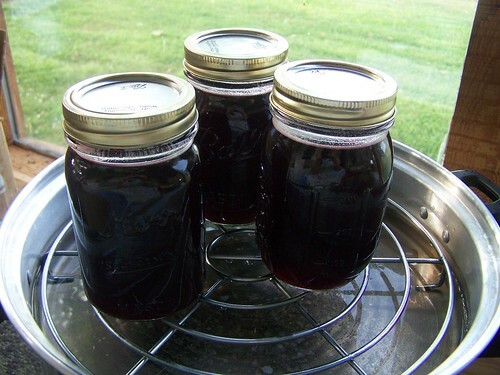 So I finally got around to making the blackberry syrup this morning.� I used about 3/4 gal. of blackberries and got three pts of syrup.� Pretty good.� I’m not sure how it will turn out but it tasted really good when I sampled it.� I put the blackberries in the steam juicer.� This is what it looks like. This is a very handy piece of equipment.�� We bought ours at our local Farmers Supply.� I’m not sure if they sell them at Wal-Mart or not but I know you can order them online.� You might even find them on Ebay.� The name brand of ours is “Back to Basics”. 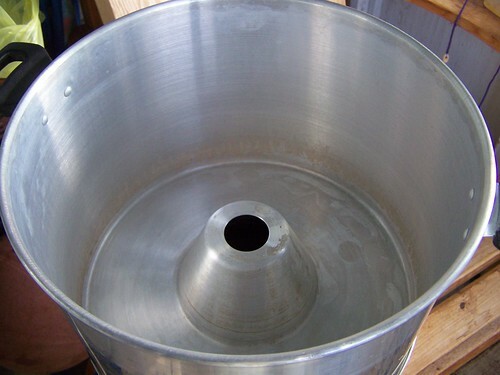 This is the bottom of the juicer.� You put 3 qts of water in this. 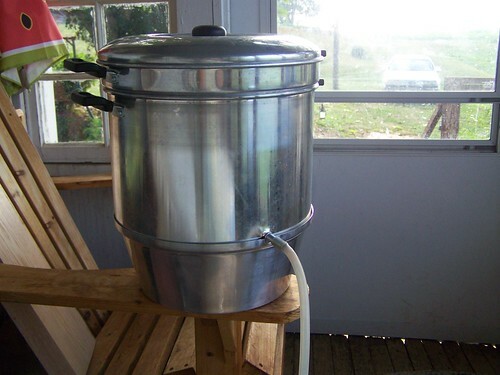 This fits directly on the water container.� This catches the juice as it comes out of the fruit. 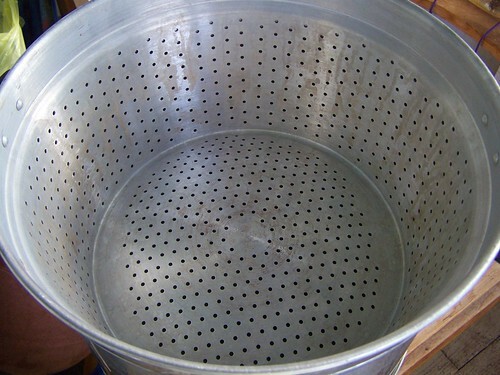 You put the fruit or veggies in this basket.� It fits directly on top of the other container.� Then put the lid on.� You see in the first picture the tubing.� This is how you drain your juice into jars.� Put it on your stove and when it starts to steam, you start timing.� Different things need to steam for different times.� Blackberries steam for 60 min.� You can then use the juice for whatever you want to make.� The pulp that remains in the basket from your fruit or veggies is still usable too.� I will show you all another time what I do with the leftover pulp. Here is the�recipe I used for making the blackberry syrup.� I got it from the internet and it is very simple.� I hope it will be good. 4 cups blackberry juice, 4 cups sugar, 1 tsp. lemon peel.� Combine all ingredients and bring to a boil.� Boil for 2 min.� Fill jars. (I used a strainer here as I did not want the lemon peel in the syrup)� Process 10 min. 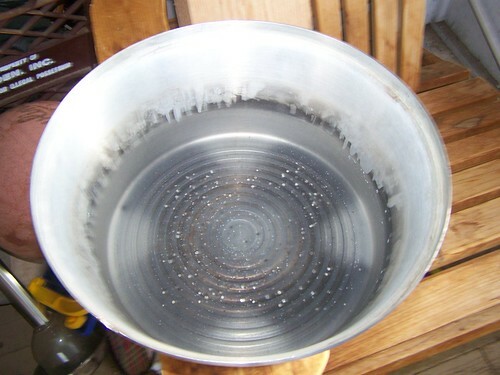 in water bath canner. It looks good. I may have to do that with all the blackberries that we have set on the canes. I really like our steamer juice. They are definitely worth it and so useful for all that I do. Hi Donna.. It seems I missed your last post.. It was so nice to see where you live and all.. I love a swing.. I have not seen a walnut tree before, either.. Do you get nuts off of it? As for the juicer it is lovely.. My friend was telling me that she and her sister in law bought one down in Maine … I am going to try and get one soon.. I imagine your syrup is delicious… I love blackberries.. It is lovely! I have never seen one before so thank you for taking pictures of it. I have been wondering about it. I will be looking for one that is for sure! I sure need one of those juicers. I’ll check back to see what you do with all the pulp. I bet you could dehydrate it and break it into chunks to flavor muffins, oatmeal or whatever. Or add some sweetness and make roll ups. I really like to dehydrate produce so I am always happy to learn what others are doing. Thanks for sharing, God Bless. I was wondering what a steam juicer looked like. Our farm supply store sells Back to Basic items but I have never seen one of those there. I think I did see a steam canner there though. Do you have one of those? I might have to check into one of these. They would be handy to have. I wonder if you can make juice from things like pear peelings? Hope you have a wonderful week.